To honor moms during the Month of May, I'm posting prayers especially for moms! The plan is to pray through a different Psalm each week. I pray it ministers to you in a special way! Thank you for all you do! 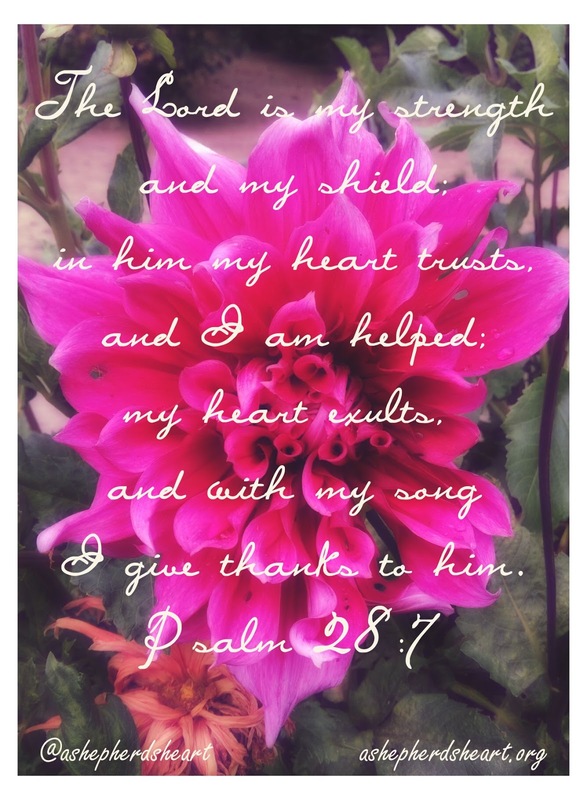 This week here's a prayer for you through Psalm 28:7. Heavenly Father, I thank You for Your truth, for building me up and daily transforming me as a mom and as Your Daughter as I read Your truth and pray through it. I thank You and praise You for Who You are, for loving me unconditionally and for being my strength through the good and the bad days. Thank You Father! Father, I'm overwhelmed sometimes with the weight of responsibilities. Sometimes I feel vulnerable and weak...and a bit battle worn on those especially tough parenting days! Thank You for being my true source of strength. Thank You for being my shield...my protector and deflecting the numerous attacks. I praise You because You are my strength and shield and cannot make it through the tough times or good times without You! I confess that sometimes I put my trust in myself, other people, my circumstance and more. I forget Who You are and all You've done and continue to do in my life and the lives of others. I sometimes let the hurts I've experienced in my past or present cloud the truth that You are good and trustworthy. I confess that sometimes I over-identify with the wrong actions of my children as if it's my fault they choose to do the opposite of how I've taught them...Help my heart trust in Your truth and know the wrong actions truly don't define me as I work hard as a mom...they are just growth moments in time. Help me to continue to love my children even through tough circumstances but separate my identity from their actions as I trust in You because I find my identity in and through Christ alone. I thank You that I can put my trust in You fully and I ask for Your help through Your Holy Spirit to trust in You at all times as a first response and not as a last resort. All You are and all You continue to do in my life cannot be cataloged as it's too numerous but please help me like the times of old recall Your Goodness, Your Help in the good and hard times. In my heart and mind may You build an "altar" of remembrance so when I go through the circumstances of life...I'll always remember where my help comes from. Shape my heart oh Lord to trust in You always and remember that it's in You that I find my help. Father, I praise You. My heart is overwhelmed and overjoyed by Your love and grace for me! Help me experience Your joy and help me to lift up a song to You in praise and worship through the day-to-day as I walk with You. I give You thanks for Who You are. I give You thanks for Your provision each day. I give You thanks for Your Word that I may be instructed on how to live successfully for Your Kingdom and Glory as Your servant. I give thanks to You for Your helper, Your Holy Spirit's guidance and residency in my life. I give You thanks for the life You've blessed me with. I thank You for my children. I thank You for the sometimes daunting but blessed privilege it is to be a mom. I thank You again for the privilege of being a mom especially as I think of dear friends who haven't yet had the privilege or cannot. Help me to never take it for granted. I thank You for the glory I can bring You through being a mom. I thank You for the strength You give me when I have none - especially during the time when I'm at the end of my rope with parenting issues. I thank You for the numerous blessings You've heaped upon me. Most of all I thank You for Your Love and Salvation. PS. If this post was of encouragement to you...consider sharing it with others whom you believe will be encouraged by it! Thanks! This is beautiful, like it was written just for my circumstances. Thank you for your prayers and love you spread through your McMinistry!